We bought these dvd shelves long ago at Ikea. We stopped storing our dvds on them about 2-3 years ago and use a nylon case now. Since we hate to have anything we don't use, and don't throw much away, we found another use for these low profile shelves. 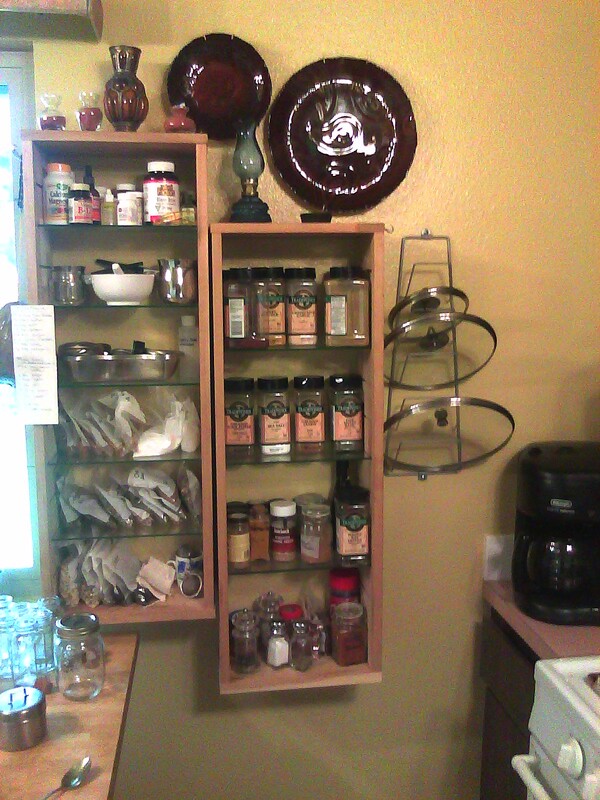 They work perfectly for storing our spices and teas. 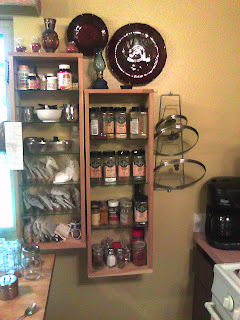 You will notice the spices in large containers (some get replenished with bulk, others get replaced when empty, but we reuse the containers), I get those from Cash and Carry. We buy those for $3-7 each which is ~¼ of the price for the equivalent amount from the store. I will always get my vanilla from there if I don't make it ($11ish for a quart, yes a quart). I love finding new purposes for older stuff. I am leaving in a couple minutes to go dumpster-diving at the colleges (graduation weekend).